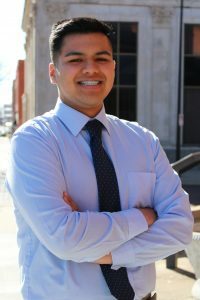 Alejandro Rangel-Lopez, an impressive high school Senior from Dodge City, Kansas, was selected as this year‘s winner of the Shulman Law Group College Scholarship Award for First Generation American High Schoolers. While the scholarship is traditionally awarded to local New Jersey students, Law firm founder Edward Shulman was so taken by Alejandro‘s personal story, his civic-mindedness, his history of volunteerism, and his passionate commitment to protect the immigrant community in his State, that he decided that Alejandro was the most worthy recipient of this annual award. Alejandro is an 18-year-old Senior at Dodge City High School, born in Kansas the son of hard-working Mexican immigrants who came to the United States in the mid-1990s to work at local meatpacking plants and to reside in an established Latino community. Facing much adversity, his family has worked strenuously to legalize their immigration status in the United States, to help their fellow community members, and to create a stable environment to nurture the goals of their promising and impressive son. Indeed, Alejandro is the model of how to raise a child with purpose, meaning, integrity, commitment, and humanitarianism. Alejandro‘s resume, at the age of 18, is more impressive than most adults in this country. He is the President of his school’s Student Council, he started the Young Democrats Club at his school, he has been involved in several community-based efforts to promote civic engagement among youth, he regularly attends political events and conferences, he helped to set up voter registration venues, he has volunteered for the Kansas chapter of the American Civil Liberties Union (ACLU), and, most recently, he has brought a critically important national focus to the major problems relating to voter suppression tactics in Dodge City, Kansas. In particular, in advance of the midterm elections, Alejandro was among the first people to discover that the long-standing voting location which had always been at the town’s centralized Civic Center was changed to a virtually inaccessible locale for the Hispanic voters in that area, a suspicious move that that has all the markings of a politically- motivated voter suppression tactic. Impressively, Alejandro took action to become one of the lead plaintiffs in a federal lawsuit filed by the ACLU, in conjunction with the League of United Latin American citizens, against Ford County Clerk Deborah Cox. The hope is for the county to reopen the original polling location. Alejandro, a named plaintiff in the lawsuit, wrote in his affidavit that exercising his right to vote holds a special significance for him because of his parents’ heavy sacrifices so he could be a United States citizen. Alejandro‘s efforts have already been far-reaching and impactful. Several local and national television and print media outlets, from the Rachel Maddow show to the New York Times, have been interviewing and citing him for his contribution to the legal efforts to help his community exercise the right to vote and to combat voter suppression. Staff at the Shulman Law Group also had the opportunity to interview Alejandro by phone. His words and his actions are noteworthy, important, and give hope that the future generation has a moral compass and can add value to our society. Alejandro is extremely goal-directed and hopes to attend law school to become an immigration lawyer one day.